Located 10kms from Kumbakonam on the Thiruvarur Road is the Naachiyaar Koil in Thiru Naraiyur. 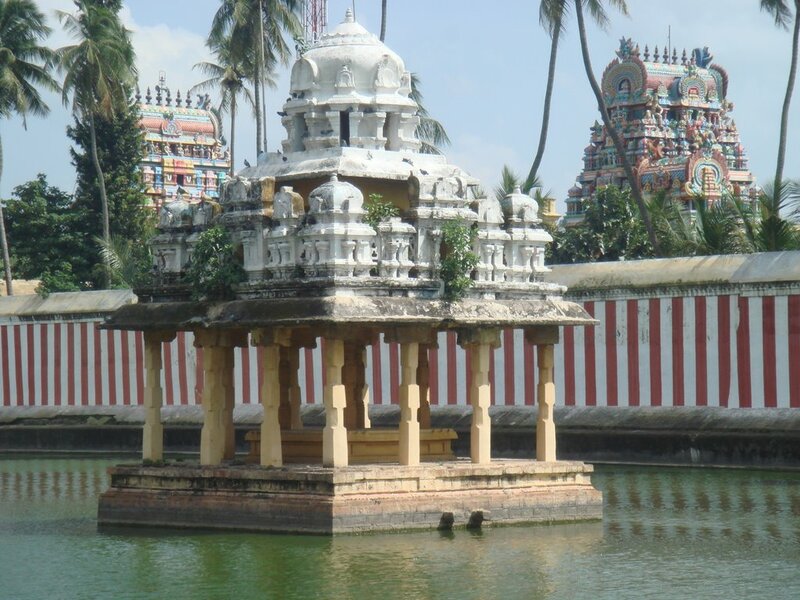 Built by the Chozha King Ko Chengan Chozhan, the Nachiyar Koil has 16 Gopurams including the 5 Tiered Raja Gopuram. Ko Chengan had already built 70 Saivite Temples and this one, the 71st, was his first Vaishnavite temple. Hence, this temple has a lot of resemblance to Saivite temples, in its form and structure. Lord was of the view that in Kali Yugam men would have to listen to women ( husband to listen to wife’s words). Hence, much before that, he decided that he would first serve as an example and listen to the Goddess here. On all occasions, the first rights are reserved for the Nachiyar. Even the food is first served to the Nachiyar and only then to the Naraiyur Nambi. Being a temple where Goddess has prominence, one can see the Lord slightly by the side and the Goddess is the one who has the prominent position inside the sanctum. Even from the entrance of the temple, one gets a glimpse of Vanjulavalli Nachiyar. Naachiyaar Koil in Thiru Naraiyur is one of the few Divya Desams where Goddess has prominence over the Lord. Some of the other Divya Desams where Goddess is dominant are Srivilliputhur, Uraiyur and Thiruvellarai. While Srivilliputhur is called Naachiyaar Thiru Maaligai, Thiru Naraiyur is called Naachiyar Koil. There is no separate Sannidhi for Goddess and she is always seen together with the Lord. Rishi Medhaavi wanted Goddess to be born as his daughter and undertook penance on the banks of the Manimutha river. Please with his penance, Goddess was born under the Vanjula tree and the Rishi brought her up as Vanjula Valli. Missing the Goddess, Lord is said to have come here to Thiru Naraiyur, given the Goddess all the powers in his 5 different forms (Sankarshanan, Pradhyumnan, Anirudhan, Purushothaman and Vasudevan) and accepted Goddess who was waiting in a wedding attire. 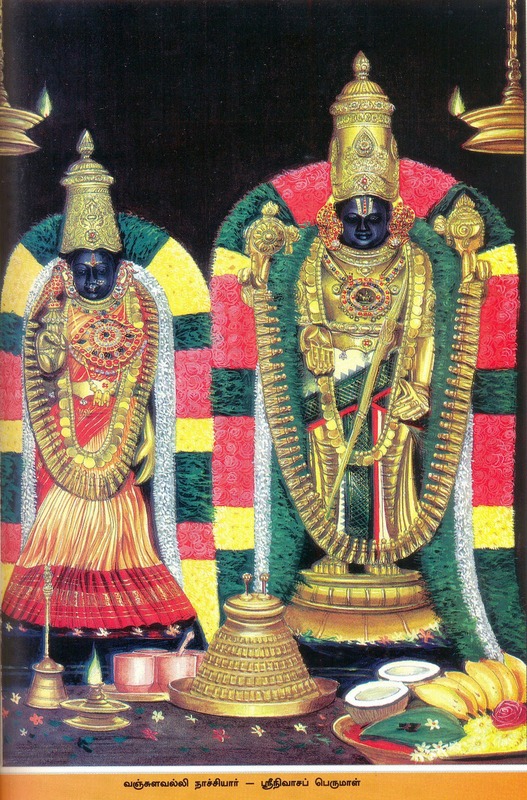 Both Lord and Nachiyar are seen here in a beautiful wedding posture, a unique feature at this Divya Desam. This is the only Divya Desam where Lord is seen with a conch and charka in front of his face.Also, interestingly, Thiru Naraiyur Nambi is seen leaning forward slightly to indicate the initiation of Pancha Samaskaaram. Thiru Mangai Mannan (Neelan) who was the army chief of a Chozha king once wanted the hand of Kumudhavalli. She said she could accept him only if he came to her with a true Vaishnavite identity. ThiruMangai Mannan looked to ThiruNaraiyur Lord to give him the Vaishnava identity and help him secure the hand of Kumudhavalli. ThiruNaraiyur Nambi is said to have initiated ThiruMangai Mannan with the Pancha Samaskaaram, which is the true identity for a Vaishnavite. Thus, Thiru Mangai Mannan (Neelan) became Thiru Mangai Azhvaar. Thiru Naraiyur Nambi is the only Divya Desam Lord to have offered the Pancha Samaskaram initiation to anyone. As a mark of initiating the Pancha Samaskaaram on the Azhvaar, Lord Srinivasa is seen leaning forward slightly, quite a unique sight at this temple. Thiru Naraiyur Lord praised as Nambi: Lords of only a few Divya Desams have been praised as Nambi. The most prominent among them is Thiru Kurungkudi, the other one being the Lord here who is referred to as Thiru Naraiyur Nambi. An Achaarya is referred to as Nambi and since Thiru Naraiyur Lord initiated the Pancha Samaskaram to ThiruMangai Mannan, he became the Achaarya of Thiru Mangai Azhvaar and hence the Azhvaar referred to him as ‘Thiru Naraiyur Nambi’. ThiruNaraiyur Nambi is also credited with the bringing together of Thirumangai Azhvaar and Kumudhavalli, as he was the one who initiated the Pancha Samaskaram to the Azhvaar, making him a true Vaishnavite. The temple has been built in such a way that one can see the sanctum even from outside the temple premises. With several layers, each comprising of several steps, leading to the sannidhi, the sanctum looks like being atop a hill, on first looks from the temple entrance. Garuda, the vehicle of the lord, is of special significance at this temple. The story goes that a sculptor who was creating an image of Garuda suddenly found the idol flying after he had made its wings. Shocked at this sudden action, the sculptor threw a stone at Garuda and struck him on the nose. Garuda came falling down and decided to settle here at this place and bless the devotees. A huge and well built Lord Garuda is seen just next to Lord Srinivasa’s Sannidhi. 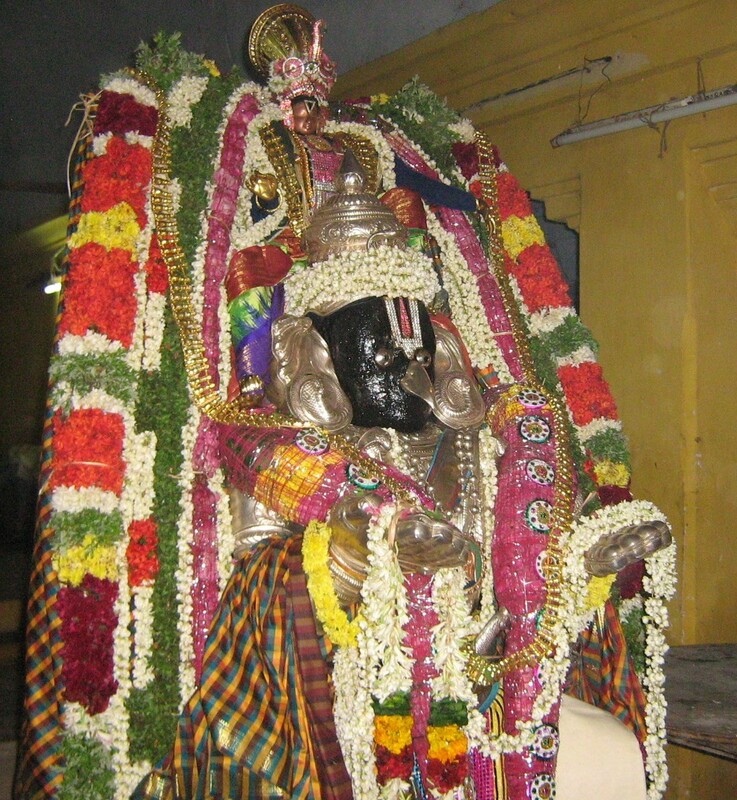 In the Tamil month of Aadi, Thiru Naraiyur Nambi makes a visit to Garuda’s Sannidhi. During street procession (Margazhi and Panguni), an unbelievable event takes place at the Nachiyar Koil. While only 4 people carry Lord Garuda out of his Sannidhi, as the Lord goes out of each Layer and prakaram, he is said to increase in weight, that 8 people, 16 and then 32 people are required to carry Lord Garuda out of the temple. Finally, when the Lord is taken outside the temple, Garuda increases in weight so much that 128 people are required to carry the Lord. On his way back, it is said that Garuda mount decreases in weight and finally when he is back in the Sannidhi, only 4 people are required to carry him. Kal Garuda is said to answer the prayers of devotees immediately and remove all Doshams. Childless couples, unmarried women, people with Naaga Dosham etc will also be relieved if they pray to the Kal Garuda at Thiru Naraiyur temple. An old Brahmin wanted to see all the Divya Desams. However, he could not visit because of his old age. The old Brahmin prayed before ThiruNaraiyur Nambi, who is said to have given the idols of all the 108 Divya Desam Lords to the Brahmin. This is the only Divya Desam where the idols of all the 108 Divya Desams can be seen. Another unique feature at this Divya Desam is that the Vimaanam above the Sanctum Sanctum is like a tower. This is the only Divya Desam where one finds a10 feet Brahma in a standing posture within the sanctum. In other Divya Desams one finds the image of Brahma on the wall. 06:30AM – 12:30PM and 04:30PM - 08:30PM. This temple is at the 6th mile from Kumbakonam on Kumbakonam-Thiruvarur route. It is better known as "Nachiyyar Koil". The temple is on road-side and no much facilities are available here. Either we had stay at Kumbakonam or at Oppiliyapan Temple and visit this temple. Nachiyar Koil - 612 602. Phone: Gopinathan Bhattar @ 9443597388 / 0435-2467167.